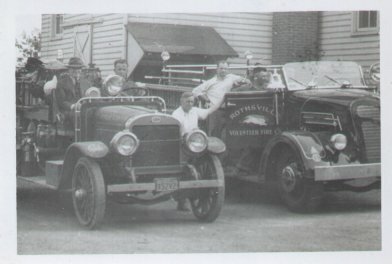 The Rothsville Volunteer Fire Company was officially chartered on November 14, 1917. Meetings were held in the basement of the Kinports Cigar Factory. The first chief was Frank M. Bowman and his assistant was B. F. Lutz. E. S. Mumma became chief in 1919. Initial discussions took place concerning the creation of a Ladies Auxiliary but no action was taken. The first motorized apparatus was a 1917 Ford chassis with the chemical tanks mounted. This engine was purchased in 1920. All the apparatus was moved to the stables of C. M. Adams in 1921. Geyer G. Hoove became chief in 1921. A Hahn engine with a 300 GPM pump and three 35-gallon chemical tanks was purchased in 1925 (on the left in the picture below). In 1925, a fire dam was built in the woods of the Henry Myers property. A pipe was installed from the fire dam to Main Street across from Mumma’s Hotel so the engines could draft water. The Ladies Auxiliary was formed in 1925. It was reorganized in 1937. 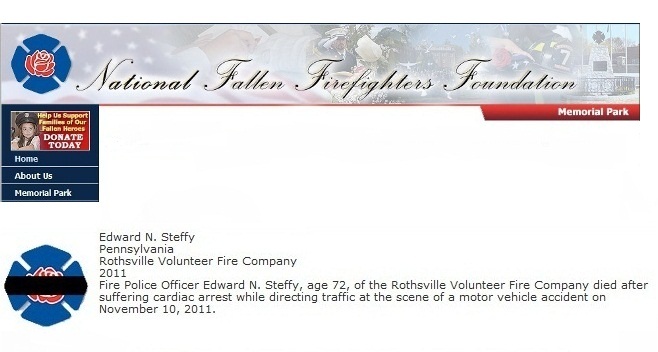 This organization would be an important part of the fire company through all the future years through to the current day. Chester H. Smith was elected chief in 1928.